Learn and Master Piano - a review from a Piano Acumen. Instalment plans over three months available with small fee. Credit card only. No paypal or other methods accepted. Guarantee – full refund if course returned within 60 days. Requirements: piano or keyboard – weighted keys preferable. What you get in the pack? 20 DVDs and 5 play-along CDs. Course book. Pros: Traditional tuition method including reading music. Covers various styles. Produced to a professional standard. One-off payment – no subscription. Cons: Expensive initial outlay, but good value with the material included. Progress may be slower than other methods as reading music is an additional skill. Course book a little small – would be better at A4 size. Suitable For: Beginners to intermediates. Legacy Learning systems have been around since 2007 and have produced various courses in piano, guitar, drums, painting, ballroom dancing and photography. “Learn and Master Piano” is a DVD instruction pack aimed at those with a desire to learn from home at their own pace. Learning from a book alone can be a challenge, so the accompanying DVDs include each lesson with the tutor. In addition , there are a series of workshops to expand certain techniques and styles. The course includes a comprehensive book that is professionally produced and well laid out. The 5 CDs are excellent quality with the songs played at various speeds and often with an accompanying band. Being an adult learner, I would not have been motivated playing Michael Row your Boat or Mary had a Little Lamb. This is a personal choice and I can see the value for children, but maybe not for adults. It was good to see that Learn and Master Piano avoids that approach taken by other courses – particularly traditional book/cd courses that have been around for a while. The course gets you playing a basic chord progression quite quickly which is pleasant to play and one you could impress your loved ones (and wouldn’t cause upset to the neighbours). This chord progression is frequented a few times in the book highlighting different chords and techniques. 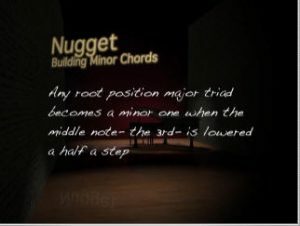 Chapter 1 also covers the basic notes on the piano and the three chords required to play the progression mentioned above. There is no music required at this stage, as this is introduced in the following chapter with the notes on the Treble Clef (music generally played by the right hand). More chords are introduced to play the next song and there are two new chord progressions. The song is well known and gets you reading treble clef and playing at the same time. The bass clef is introduced in Chapter 4 (These are notes generally played by the left hand). The course book and DVD lessons build the level of difficulty, theory and technique in a structured and measured way. Tips and “Nuggets” of information are presented to cement key ideas into your head. Each chapter starts with a quote from a musician, an overview of the chapter and skills that will be learned. Links to the CDs are also well flagged. The chapter finishes with a “you’re ready to move on when…” which is a checklist of skills you should have learned. This is a good frawework and prevents you from progressing too quickly before learning the basics. Generally they are snippets of the main themes and simplified rather than a reproduction of the entire song. The teacher includes his own arrangements to demonstrate techniques, theory and styles. This sounds daunting to the beginner, but the basic techniques and theory are built upon slowly building your knowledge in a logical manner. Will Barrow – Learn and Master Piano tutor. 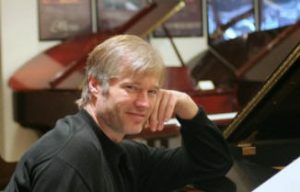 Will Barrow is a professionally trained pianist with experience in teaching, composing, and touring with various artists. He is a Grammy award winning singer-songwriter, has worked on Broadway and performed at many jazz and music festivals throughout Europe and the U.S. He has released two CDs and continues to do session work and teach. Check Will Barrow’s website for further details. 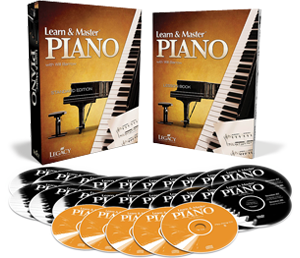 Learn and Master Piano is a thorough and well developed course pack that has a wealth of information including techniques, theory, songs to learn and recommended listening. The price seems high as initial outlay, but if you had individual piano lessons with a teacher it would cost a huge amount more to cover the same material. In that respect it is good value. It’s also a one-off payment rather than a subscription which may be a preference to some. Being slightly pedantic, the course book could be A4 size instead of 25cm by 20.5cm, but it is printed in a good sized, clear font, with the music notation also clear. The DVD lessons and workshops are expertly produced with good picture and sound quality. The content of songs is a good back-bone for a repertoire covering many styles. Will’s own tunes/chord progressions are fun to play and he presents the course in a relaxed style – speaking and playing slowly. This is a traditional learning method of reading music in line with playing the piano. It may not suit everyone and other courses reviewed here may get you playing quicker especially if you have no desire to read music. That is a personal choice. I got a big win from playing the simplified, main part version of “The Entertainer”. It involves a syncopated rhythm with one hand and a straight rhythm with the other. I learnt and mastered each hand and then slowly brought them together. Playing vamp chords to the Van Morrison song “Moondance” was also a step upwards with my technique and timing. There is another Legacy Learn and Master Piano course to follow if you wish to continue to an advanced level. Would I consider this and other Legacy products? I possibly would in the future and may take a look at the guitar course. As for Ball room dancing? I’ll leave that for others!